Want an attractive flooring option without exhaustive maintenance or a high price tag? Shop at our reputable flooring store for a huge selection of stylish and durable laminate flooring. Take advantage of this versatile flooring option to beautify your home. Laminate floors have changed much in recent years and now look just as stunning as tile and hardwood with new, multidimensional patterns without the hefty price. Changes in technology make laminate far more comfortable to walk on, thanks to new installation methods that include four layers for durability. Made for easy daily cleaning and heavy foot traffic, the laminate flooring we offer is perfect for all homes. Households with pets, children, or numerous activities are perfect candidates for this ideal flooring. In addition, there is no worry about extensive upkeep or frequent replacements. With our laminates, you get the look of high-end floors at low, budget-friendly prices. Don’t worry about the laminate floor installation process—we handle that for you too. 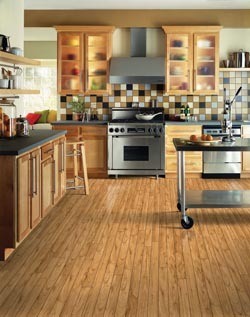 Our technicians are qualified to properly install your laminate so you can enjoy its quality for years to come. With the variety of brands and styles available, you’re sure to love your floors and see your home in a new light. Take advantage of the benefits of laminate floors without the cost associated with other flooring options. We only sell trusted brands that lead in the industry. Known for quality, style, and durability, these brands have the perfect look to boost your home’s appearance and value. Why search for someone to handle your laminate flooring installation when we offer expert in-house services? Any customer within our service area is welcome to schedule installation from our professional flooring contractors. This streamlines the overall process, as our contractors have extensive knowledge about our laminate floors. Because our contractors don’t have the same overhead as independent professionals, their laminate flooring installation rates are far more reasonable. Call us today to learn more about our installations and how we can improve your home with our laminate floors. If hardwood or tile floors are out of your price range, don’t let that stop you from getting the look you want in your home. Since laminate flooring imitates the appearance of other high-end types of flooring, you can enjoy stunningly beautiful floors without the high price tag. At the same time, laminate comes in all colors and textures. Complement your existing home décor or do something new by choosing a laminate floor product that caters to your wishes. We have so many products to choose from at our warehouse showroom. Allow one of our friendly and knowledgeable flooring specialists to help you find a floor that is right for you. Are you looking for affordable, high-quality flooring in the Otsego, MN area? Contact Focal Point Flooring today! We proudly serve Otsego, Minneapolis, Maple Grove, Brooklyn, and Buffalo, MN, plus all of the surrounding areas.